This is the month of love and I'm overwhelmed with how many of you have been joining in with my Love Beading project. 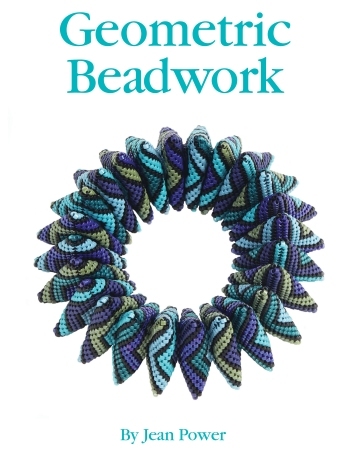 Literally thousands of you have downloaded the free patterns and it's been lovely hearing from you with photos of your work & stories of the beadwork being shared with loved ones. As always I've been working away behind the scenes on lots of different projects and I'm pleased today to be able to be able to launch one (a new set of geometric enamel pins) and bring you advance news of 2 others (a new book and a revamp of 2 old books). 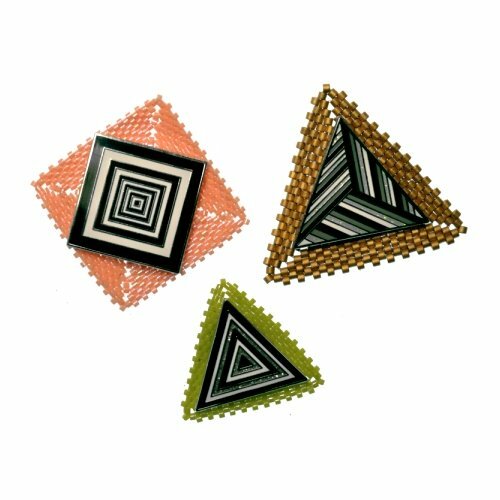 Following on from the Flower Pin Set I launched back in December, I am today launching a brand new Geometric Pin Set designed to help you make geometric, colourful, interchangeable jewellery. The idea is that you create your own unique, geometric beadwork which can be worn behind the pins and then removed, swapped or added to whenever you want a change. 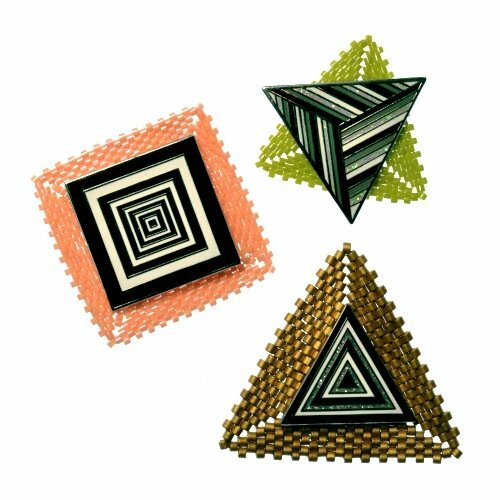 Each set comes with 3 pins: 2 triangles and a square. 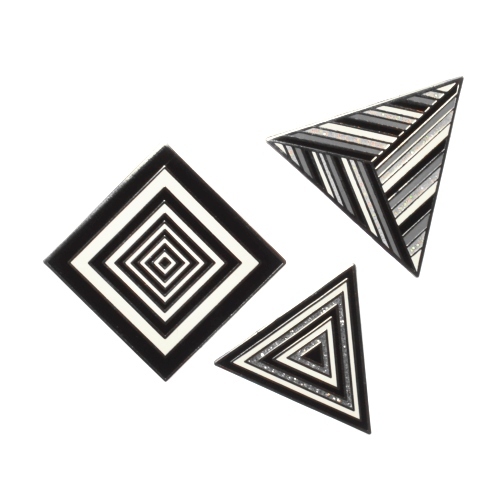 Each has a unique geometric design in black and white and the triangles also have some subtle, sparkly grey glitter added. 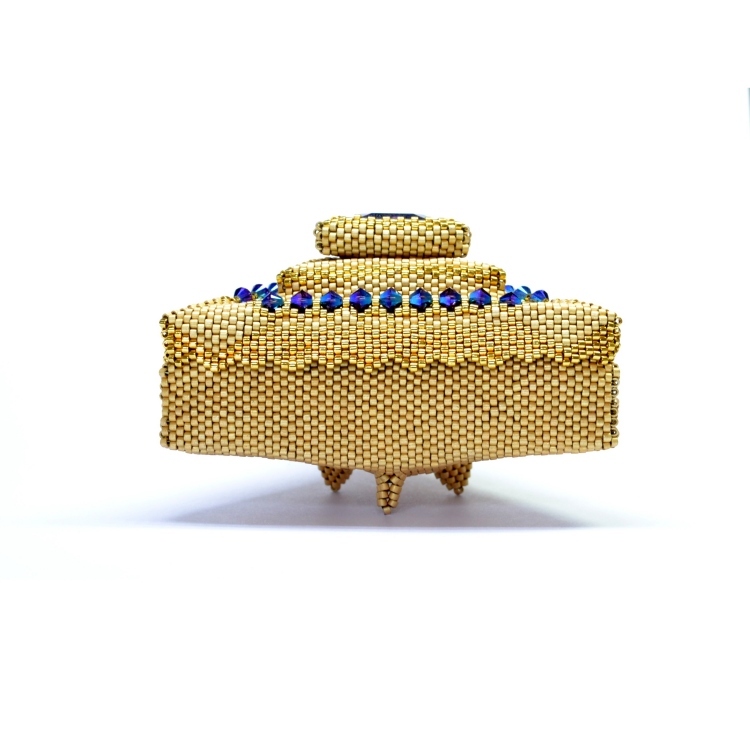 Their monochrome colouring means you can use any colour of bead to mix-and-match for the look you desire. The pins even look great worn by themselves! These pins are available for just £29 for the set but you can use the newsletter discount code to get £2 off whilst stocks last (this discount now applies to the remainder of the Flower Pin Sets also). For a very long time now I've been secretly working behind the scenes on a new Rivolis based book and now its pages pages are slowly coming together. 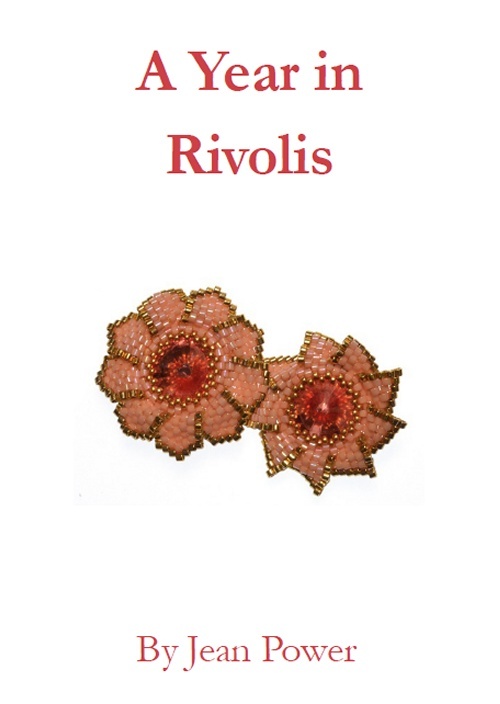 I'm going to begin sharing images of the 52+ projects along with advanced copies of the instructions with purchasers of My Favourite Rivolis Collection (they also get a free digital version of the book). It's been huge fun working with so many sparkling crystals and coming up with unique and new ideas & projects to fill the pages - and I'm looking forward to beginning to share them with you over the coming months. 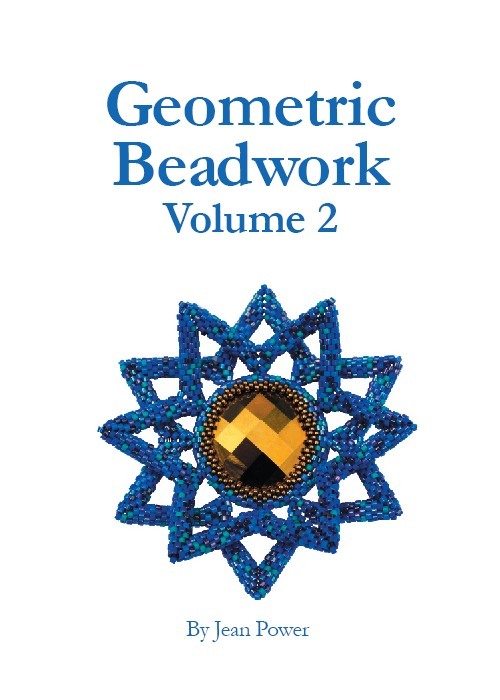 My stocks of Geometric Beadwork and Geometric Beadwork Volume Two are now down to less than 30 of each and I have decided not to do another print run. Instead I will be moving the books over to 'print on demand' so, whilst they'll still be available to purchase, they won't come directly from me and therefore no signatures or personal messages will be able to be included. Also the books won't be the same format as previously (they will be different sizes and on different paper) so if you want a matching set then please make sure you purchase them ASAP while I still have stock. The good news about this is that it will make it easier for your local bead or book shop around the World to stock them and, as they'll be sold through CreateSpace/ Amazon, you'll be able to more easily ask friends and family to buy them for you! I'm about to start my 2017 classes and I'm delighted to announce a new venue - WirWar Kralen in The Netherlands! This will join all the other venues I'm teaching in this year and you can see all my classes organised by venue here and date here and I hope to see you at one of them in 2017. Please make sure the discount is applied to your basket total BEFORE you finish checking out. Also ensure you type the code without the quote marks. The code is valid until the end of December 2017. 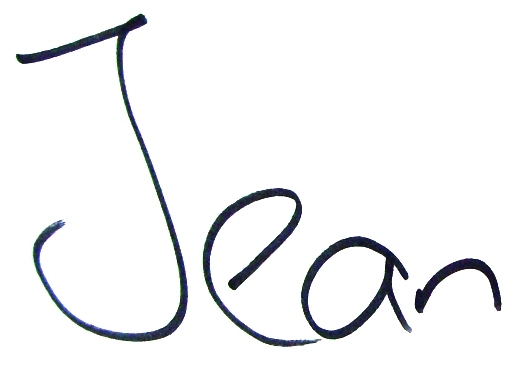 Copyright © 2017 Jean Power, All rights reserved.